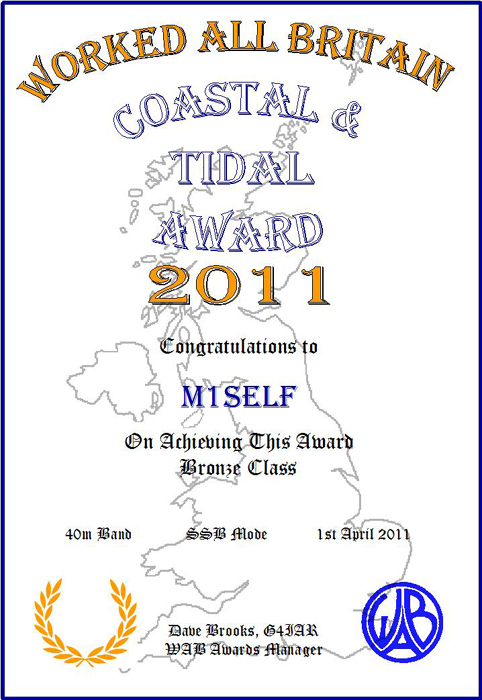 Please Note: The Coastal & Tidal Award has now finished. No further Award claims may be made. For 2011, W.A.B. 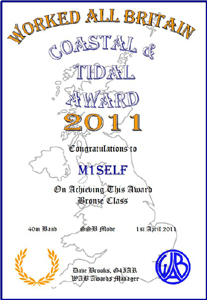 are running the Coastal & Tidal Award. The requirements are to work/activate as many W.A.B. Squares containing Tidal Water as you can. Valid squares are those shown as tidal on Ordnance Survey maps, as defined by the Normal Tidal Reach. There are seven classes of the Award: Basic, Bronze, Silver, Gold, Platinum, Sapphire and Diamond, with an Honour Roll for those who have passed the requirements for the Diamond Award. Each can be claimed when the requirement is reached. The requirements are shown below. All contacts must be made within the 2011 calendar year, i.e. 1st January - 31st December 2011.